The cathode-ray tube ruled the display world from the earliest days of TV until only comparatively recently, when flat-screen technology began to take over. CRTs just kept getting bigger over that time until they reached a limit beyond which the tubes got just too bulky to be practical. But there was action at the low end of the CRT market, too. Tiny CRTs popped up in all sorts of products, from camcorders to the famous Sony Watchman. One nifty CRT from this group, a flat(tish) tube from a video intercom system, ended up in [bitluni]’s lab, where he’s in the process of turning it into a retro Game Boy clone with a CRT display. The display, which once showed the video from a door-mounted camera, was a gift from a viewer. Date codes on the display show it’s a surprisingly recent device; were monochrome TFT displays that hard to come by in 2007? Regardless, it’s a neat design, with the electron gun shooting upward toward a curved phosphor screen. 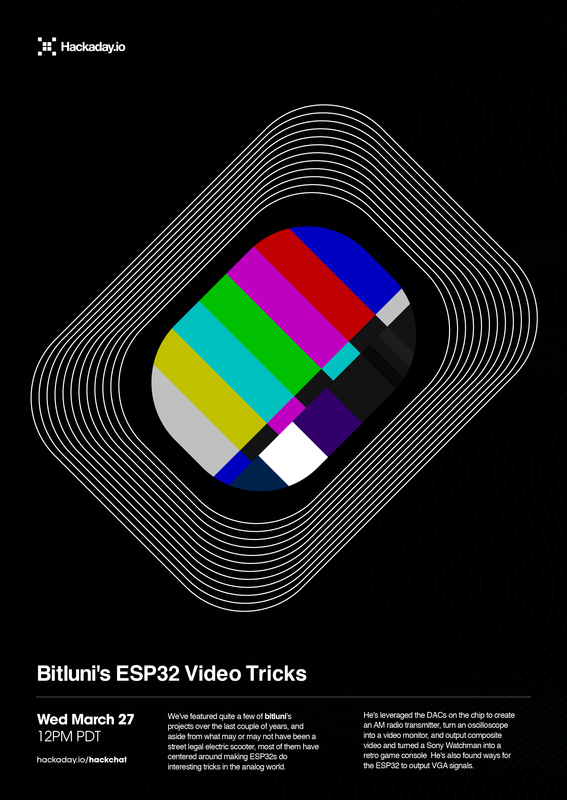 With a little Google-assisted reverse engineering, [Bitluni] was able to track done the video connections needed to use his retro game console, which uses an ESP32 that outputs composite video. He harvested the intercom speaker for game audio, added a temporary Nintendo gamepad, and soon he was playing Tetris in glorious monochrome on the flat screen. The video below is only the first in a series where the prototype will be stuffed into one nice tidy package. It certainly still needs some tweaking, but it’s off to a great start. We can’t wait to see the finished product. When you acquired your first oscilloscope, what were the first waveforms you had a look at with it? The calibration output, and maybe your signal generator. Then if you are like me, you probably went hunting round your bench to find a more interesting waveform or two. In my case that led me to a TV tuner and IF strip, and my first glimpse of a video signal. An analogue video signal may be something that is a little less ubiquitous in these days of LCD screens and HDMI connectors, but it remains a fascinating subject and one whose intricacies are still worthwhile knowing. Perhaps your desktop computer no longer drives a composite monitor, but a video signal is still a handy way to add a display to many low-powered microcontroller boards. When you see Arduinos and ESP8266s producing colour composite video on hardware never intended for the purpose you may begin to understand why an in-depth knowledge of a video waveform can be useful to have. The purpose of a video signal is to both convey the picture information in the form of luminiance and chrominance (light & dark, and colour), and all the information required to keep the display in complete synchronisation with the source. It must do this with accurate and consistent timing, and because it is a technology with roots in the early 20th century all the information it contains must be retrievable with the consumer electronic components of that time. We’ll now take a look at the waveform and in particular its timing in detail, and try to convey some of its ways. You will be aware that there are different TV systems such as PAL and NTSC which each have their own tightly-defined timings, however for most of this article we will be treating all systems as more-or-less identical because they work in a sufficiently similar manner.